The Bloomsbury Group included a number of painters and designers who had an important influence on the visual and decorative arts during the period of English modernism (1905—1930). The group included artists Vanessa Bell and her husband Clive Bell; the artist and critic (and Vanessa Bell’s lover) Roger Fry; the artist (and Vanessa Bell’s lifetime companion) Duncan Grant, plus painters Dora Carrington and Mark Gertler. Bloomsbury art and design was never a coherent movement with an agreed set of theories: it was a close-knit group of friends who shared an interest in aesthetics. The following publications deal with the amazingly wide range of their art in its pure and applied manifestations. These range from easel paintings, public commissions, interior designs, book illustrations, furniture and tapestries, plus the celebrated wall decorations at Charleston. The Art of Bloomsbury features the paintings and drawings of artists Roger Fry, Vanessa Bell, and Duncan Grant – three of the central figures of the Bloomsbury Group. There are entries on two hundred works of art, all illustrated in colour, which bring out the chief characteristics of Bloomsbury painting – domestic, contemplative, sensuous, and essentially pacific. These are seen in landscapes, portraits, and still lifes set in London, Sussex, and the South of France. The volume also features the abstract painting and applied art that placed these artists at the forefront of the avant-garde before the First World War. There are portraits of family and friends – from Virginia Woolf and Maynard Keynes to Aldous Huxley and Edith Sitwell. Essays by leading scholars provide further insights into the works and the changing critical reaction to them. 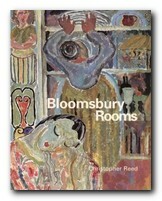 Bloomsbury Rooms: Modernism, Subculture, and Domesticity is a scholarly study which traces the development of Bloomsbury’s domestic aesthetic from the group’s influential Post-Impressionism in Britain around 1910 through to the 1930s. Christopher Reed makes detailed studies of rooms and environments created by Virginia Woolf’s sister Vanessa Bell, Duncan Grant, and Roger Fry, and he puts them into the context of aesthetic debates of the period. His study challenges the accepted notion that these artists drifted away from orthodox modernism. Whatever you think of the book’s theoretical arguments, it’s a beautifully illustrated production, full of fascinating paintings, fabrics, decoration, interior design, and original graphics. The Art of Dora Carrington At the age of 38, Dora Carrington (1893-1932) committed suicide, unable to contemplate living without her companion, Lytton Strachey, who had died a few weeks before. The association with Lytton and his Bloomsbury friends, combined with her own modesty have tended to overshadow Carrington’s contribution to modern British painting. She hardly exhibited at all during her own lifetime, and didn’t even bother signing her own works. This book aims to redress the balance by looking at the immense range of her work. She produced portraits, landscapes, glass paintings, letter illustrations and decorative work – all illustrated here in full colour. It also acts as an introduction to the artist herself, with rare photographs helping form a fuller picture of this fascinating woman. The Bloomsbury Artists: Prints and Book Designs This volume catalogues the woodcuts, lithographs, etchings and other prints created by Vanessa Bell, Dora Carrington, Roger Fry and Duncan Grant – with various colour and black and white reproductions. Of particular interest are the many book jackets designed for the Hogarth Press, the publishing company established by Leonard Woolf and Virginia Woolf. Also included are ephemera such as social invitations, trade cards, catalogue covers, and bookplates. Many of these were produced as part of the movement for modern design established by the Omega Workshops. 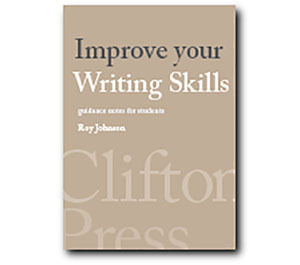 Vision and Design is a collection of Roger Fry’s best articles and writings. It had a significant impact on the art world in the 1920s and 1930s. Unlike many critics and scholars of the time, Fry expanded his discussion on art outside of the Western world, even to the degree of contending that primitive sculpture surpasses that of the West. As well as Western art, the book examines the use of form and aesthetics in ethnic art from Africa, America and Asia. It reinforced his position as a critic and it is still recognised as an extremely influential work in the development of modernist theory. 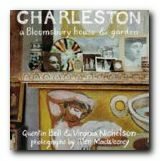 Charleston: A Bloomsbury House and Garden by Quentin Bell and Virginia Nicolson encapsulates the artistic sensibility of the Bloomsbury Group. It is an illustrated record of the farmhouse at Charleston in Sussex which Vanessa Bell and Duncan Grant treated as a blank canvas in interior design. In doing so, they created a treasury of Bloomsbury art. The book provides family memories and anecdotes drawn from a lifetime’s experience. Each room links the interiors with some of the leading cultural figures of the 20th century, plus guests such as Vanessa’s sister Virginia Woolf and Lytton Strachey. Specially commissioned photographs portray the essence of the Bloomsbury style both throughout the house, with its painted furniture and walls, plus decorative items, paintings, and objects in the garden. The Art of Duncan Grant In addition to being a central figure in the Bloomsbury group, Duncan Grant played a leading role in the establishment of modernist art in Britain. His principal works were easel paintings, but he also produced murals, fabric designs, theatre and ballet work, illustration and print-making, and commercial interior decoration. Throughout a long life Duncan Grant continued to experiment with and adapt to new styles and techniques, and this book offers an opportunity to grasp the extent of his achievement. It examines the influence that people and places had on him and demonstrates, with more than a hundred illustrations of his work, the range of his talent. It’s been said that he was as polymorphous in his work as he was in his much-discussed private life.